Dear neighbors, please forgive me. I drove 35 mph on our street. Reason? Real underwear and the need to pee. That morning my toddler gave real underwear his first try. I stressed the need to tell me when he felt he had to “go.” Otherwise, we would have a mess. He smiled at how warm and comfy the underwear were compared to Pull-ups. He was quick to tell me in the car, so we could rush home. And yes, we made it. But it reminded me that we are constantly rushing. Rush to get ready for work/school, rush to make that conference call, rush to pick up my child, rush through a drive-thru for food before swimming, rush to relieve the childcare provider, rush to swim lessons, rush to a convenience store for milk, rush home to shower, do homework, read, and get decent sleep, rush to knock at least one thing of my To-Do list before bed. Then WISH myself to sleep because I now have insomnia from being on constant overdrive. Ugh! Time is not my friend. And this is only one day. I hear other parents commiserate that they have only one free night a week – some not even that. I can’t even imagine. Kids are doing homework in the car going from place to place. McDonalds is making too much money off our busy schedules. Kids are falling asleep on the way home. I don’t want this to be our life. Wasn’t it the tortoise that won the race in The Tortoise and the Hare? The point of the story was to be slow and steady, keeping your eyes on the goal, right? I think it’s time to revisit this age-old fable. Slow and steady – To me, this means we make time for the important things, and we don’t miss the journey along the way. The hare’s speed prevented him from seeing what was around him. How can we appreciate things that matter most if we’re constantly moving? What kind of quality attention can we give our family if we are “on the go” non-stop? Eyes on the goal – The hare’s arrogance at thinking he could nap prevented him from winning the race. We are not superbeings who can keep up life at this speed forever. How often have we thought our juggling act is going well, only to have life throw us a flame-lit missile to add to it? Might slowing things down help us handle those missiles a bit better? Rather than have my eyes on the objects I’m juggling, I want my eyes on my family. I’m not saying that busy people are unable to achieve these things. Some people are energized with constant activity. It’s what makes them tick. Nothing wrong with that. But I don’t see it working for us, and we don’t need to be like the rest of the world. Sometimes for short durations, we need to be the hare, sprinting to accomplish something important. I get that. But in the long run, I’d like to focus on the slow and steady progress of the turtle. In fact, when life throws rocks my way (and there have been some lately), I need to remember to simply take one step forward each day. So for us, there will be swim lessons to ensure a life-long, survival knowledge. There will be soccer because it’s the sport my son loves best. There will be church for obvious reasons. The rest of the nights with the precious little time between school and bedtime will be busy enough with dinner, school functions, social occasions, errands, chores, homework, reading – with as many smiles, laughter, and play as we can fit. And here are my replacements for other scheduled activities. I want those homemade meals at the table – on a regular basis, to emphasize the need for our family to reconnect after a busy day (not to mention eat healthier) and remember what matters most – each other. I want time to look each child in the eyes – to devote my full attention to what’s on his mind and in his heart, so that he remembers I am always here for him and always listening, and we will make the time for it because each of them is so incredibly valuable to me. The same for hubby. I want my entire family to know what to do with quiet – to have the opportunity to recharge, to discover new things they’re passionate about, to think of others, to pray. I want my kids to cherish the gift of slowing down – and to, hopefully, remember this gift when life throws too much business at them, especially later when they enter the complicated life of adulthood. Why put so much into their schedules now when we have the chance to control it? And though I don’t know how yet, I will be praying for ways to slow down even further. I want to be that turtle – not missing life as it passes me by like it does the hare who’s racing through. I want my kids to value the journey and not just the finish line. I want to receive a gold medal from my kids for the parent I am. 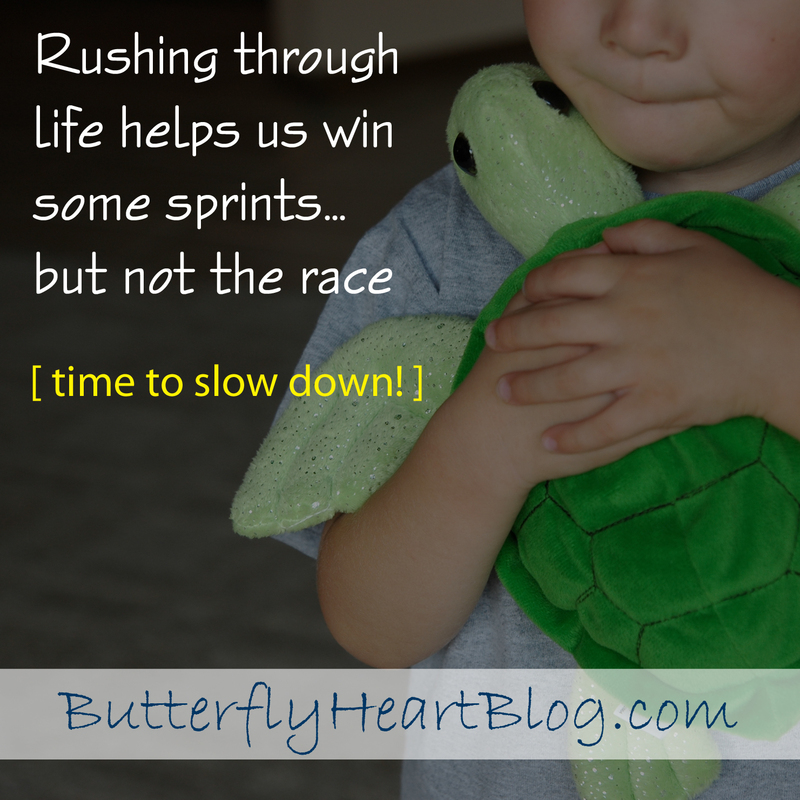 This race of life is the one I want to win at, not the sprints along the way. Slow and steady it is! How does your family slow things down? And what are your important things that never slip from the schedule? IF YOU MISSED LAST WEEK’S POST…YOU REALLY DIDN’T!